As Founder of Loonskin Labs, Studio [Y] gave Charlie Katrycz the resources to build a team and develop a business plan, become a semi-finalist in the world's largest biotech competition, and conduct product and manufacturing research and development at Autodesk's manufacturing facility at Pier 9. My leg was shaking. Well over 600 people crammed in, waiting to be wowed. 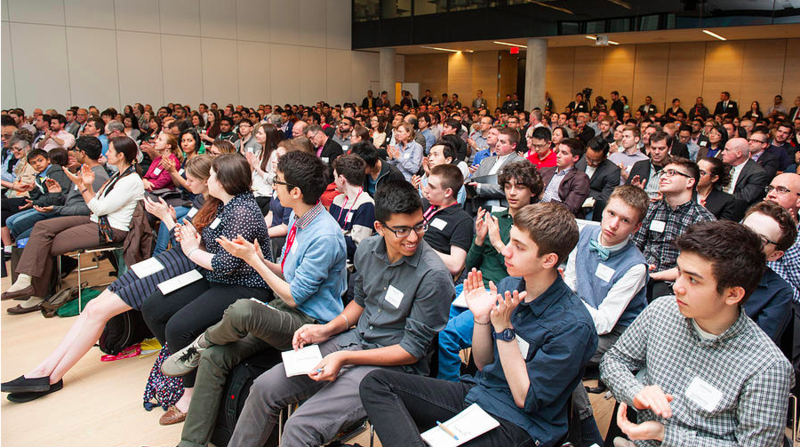 Demo Day is a big deal at University of Toronto's Rotman School of Management. The crowd was slowly being warmed up by the Lab's previous success stories. The bench had been set. Expectations ran high. I was selected to be the first demo on stage. Was I prepared? The night before had been a big showcase at MaRS - Studio [Y] Fellows were graduating to the alumni roster. A few hundred gathered. Friends, family, and the MaRS community came out to support the accomplishments of this nascent program. The room was warm and welcoming. Dimly lit, a living room atmosphere was set by Keaton Evans - photographs of travels to northern communitities hung from the walls, throw rugs, pillows, chairs, and musical instruments lay about. People told stories and songs were sang. It was as warm and welcoming as it gets. Back to Demo Day. The bright lighting exposed my every insecurity as the huge crowd hushed as I took to the stage. I was so happy to have the practice from the previous night. Control my breathing, minimize the gravity of the situation ('it will all be fine! people do this every day, this aint the first time and it won't be the last!') look for a familiar face in the crowd... none. My mum and team mate Graham were hidden somewhere in the sea. 600 people may not seem lie that many, but when they are all looking at you for entertainment, they have the tendency to grow in weight and measure. I made it through my pitch unscathed, though unintentionally I omitted the intriguing stat that our suits could cool surfaces 3X faster than those worn by NASA astronauts to keep cool in space. Oh well. There is always next time. I hope for Loonskin Labs that we make it into the Creative Destruction Lab - they are the gold standard in Canadian accelerators, and it would be an honor to join the ranks of OTI Lumionics, Thalmic, and Nymi. We were lucky enough to be featured in an article on Betakit after the event. Over the past week our team was in San Francisco competing in the Oxrbidge Biotech Roundtable and SRone Onestart Competition. The OneStart Competition is the largest biotech startup competition globally, and brings together biotech teams from top academic institutions including Harvard, MIT, and Stanford. It was a thrill to be a semifinalist among such talented researchers. The event spanned two full days of lectures and workshops on entrepreneurship in the medical industry, bringing in industry experts from Johnson&Johnson, Bristol-Myers Squibb, and GlaxoSmithKline. A highly informative and exciting event, we look forward to seeing the results, and staying involved with OneStart in the future. In late December, Charlie Katrycz received word that he’d made it to the semi-final round of the Oxbridge Biotech Roundtable — the largest biotech start-up competition in the world. His team, the four-person group at Loonskin Labs was one of 35 teams out of 300 that was selected to compete at the semi-final round in San Francisco in February. At that time, they’ll pitch once again, before having a shot at 150k and free lab space should they make it to the final round. The group is making a wearable garment that has an embedded circulatory system — a product designed to help those who suffer from thermoregulatory challenges — such as those who suffer from diabetes, multiple sclerosis or parkinson’s disease. The product also has the potential for non-health related applications. Katrycz imagines a time when triathletes, skiers, astronauts or scuba divers could heat or cool their bodies faster than mother nature allows. For Katrycz, this project has been a labour of love that began during his undergraduate studies at McGill University, when he first became fascinated by patterns and fractals in nature. When he moved home to Toronto, he started doing experiments in his parents basement, eventually renovating the space to enable his work. During his time at Studio Y, Katrycz has worked tirelessly on Loonskin Labs, seeking to explore the many potential uses for the technology he’s developing. During his time at Studio Y, Katrycz has also been able to benefit from the support and collaboration with other Fellows in the program. Recognizing their compatible skillsets, Fellow Hilary Predko has gotten involved in Loonskin Labs, leveraging her experience in wearable technology to support the development of the garments. Join us as we congratulate Charlie on this accomplishment and support him as he continues to build Loonskin Labs! Find out more on the MaRS website!